The Peugeot 308 is a small family car produced by the French car manufacturer Peugeot. It was unveiled on 5 June 2007, and launched in September 2007. 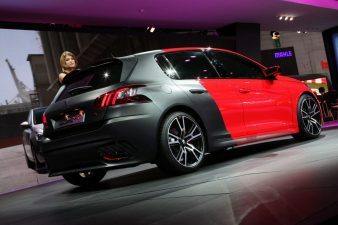 Its development code was “Project T7”, and is the first car of the X08 generation of Peugeot models. The 308 features a range of petrol and diesel engine options. In March 2011, the 308 received a facelift and it premiered at the Geneva Motor Show. The second generation 308 was displayed in Autumn 2013 with updated style along with the 508 and the 208. Peugeot changed its numbering system where the final digit is fixed: 8 for the mainstream range, and 1 for the models aimed at emerging countries, such as the Peugeot 301. It is built on the PSA EMP2 platform, shared with Citroën C4 Picasso, resulting in 140kg weight loss compared to previous generation. The changes included daytime running lights/DRL at the bottom and the blinker (turn signal indicator) is on the daytime light, advising the pedestrian or other road user to which direction it is moving.